The collection of essays presented in this volume represents some of the best recent critical work on William Blake as poet, prophet, visual artist, and social and political critic of his time. The critical range that is represented includes examples of Marxist, New Historicist, Feminist and Psychoanalytical approaches to Blake. 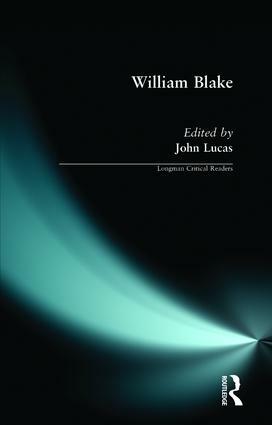 Taken together, the essays consider all areas and moments of Blake's career as poet, from the early lyrics to his later epic poems, and they have been chosen to reveal not only the range of Blake's concerns but also to alert the reader to the rich variety of contemporary criticism that is devoted to him. Although the majority of essays are devoted to Blake as poet, others consider his work as printmaker, illustrator, and visionary artist. However severely individual essays choose to judge him, ultimately all the contributions to this book affirm Blake as one of the great geniuses of English art and letters. William Blake provides a valuable introduction by one of Britain's foremost critics and will be welcomed by students wanting to familiarise themselves with the work of Blake. 2. E.P Thompson, "The Divine Image"
3. John Mee, "Dangerous Enthusiasm"
4. David Erdman, "Infinite London"
5. Stewart Crehan, "Producers and Devourers"
6. Susan Matthews, "Jerusalem and Nationalism"
7. John Barrell, "'Original', 'Character' and 'Individual'"
8. Kathleen Raine, "A New Mode of Printing"
9. Brenda S. Webster, "Blake, Women, and Sexuality"
10. Gerda S. Norvig, "Female Subjectivity and the Desire of Reading (in)to Balke's Book of Thel"
11. Michael Simpson, "Who Didn't Kill Blake's Fly: Moral Law and the Rule of Grammar in Songs of Experience"
12. Matt Simpson, "Blake's Songs of Innocence and Experience"